I want to put out a word of encouragement to all of you who might be thinking of some contest participation this season, particularly if it might be your first time. It can be a lot of fun especially at the levels of club and local contests that most of us would engage in. Don't take it too seriously, but prepare well enough to ward off frustrations with equipment and flying skill. Then go with the idea of meeting great people, and enjoying competing with them for fun. You will also be helping to perpetuate an aspect of the hobby that many enjoy. Remember, if people don't participate in contest, they will soon be a thing of the past. And that would truly be a shame. Try it, you might like it. And just a reminder, We will have club trainers and Intro Pilots to give instruction to anyone interested in learning to fly control line at all our events. So please invite curious friends and family to give it a try. 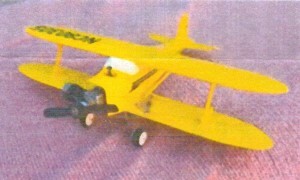 Of course once they have flown solo, an AMA membership is required for further flying at club events and at the club field. And of course they will want to become a Bean Hill Flier! June 10 Annual club flying at the EAA open house at Meadville, PA airport. Hours are 8 am to 4 pm but come early and try their breakfast. We need all the pilots we can get and lots of planes. For information contact Randy Shaffer. June 12-16 Brodaks fly-in in Carmichaels, PA. All I can say is try to be there. If you're not, you're missing the biggest event of the year for us. July 15 The Bean Hill flyers first scheduled event of the year. Come to fly for fun or enter in a stunt competition, or Foxberg race. Our club Winter Building event will also be on this day. 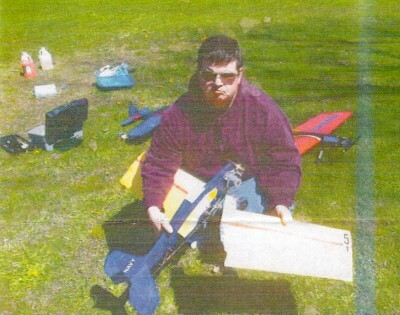 Aug 3 Annual Club flying for the Dan Rice Days celebration in Girard, PA from 1 pm to 5 pm .. This is a rough field flying at its best. This is another event where we need lots of participation and planes. For information contact Dalton Hammett. 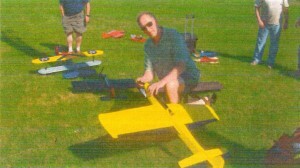 Aug 11 Annual Club flying for the Erie Model Air Show from 10 am to 4 pm, but come early to help set up if you can. Again, we need good participation and a lot of planes. For information contact Mike Ditrich. 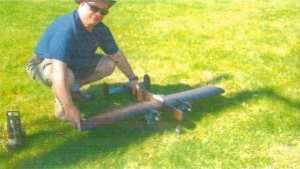 Art Nordquist has a large lot of control line equipment for sale including planes, engines, handles, lines and more. For information please contact Art at 724-629-0000. Well the leaves are coming out and the engines are revving by now. We got a beautiful stretch of weather that really rekindled my enthusiasm for some flying. My dad and I got out every chance we had during this nice stretch and several planes paid the price. Nothing like a couple crashes to start things off right. I just want to sum up a couple safety points in this column. I'll keep it brief so I can get back to gluing. 1. Use your head at all times. When you lose your wits, things go bad. If your engine is giving you fits, don't throw off the glove or put down the starter and just start hand flipping it like a madman. That thing can go at any second and if you're more frustrated than focused, you'll be getting stitches. Think about what you're doing. 2. Walk your lines every time you go from starting the engine out to the handle. Line connectors can become tangled and kinked just from handling the plane. Nothing worse than getting airborne and realizing you have only full up control. Up is only up so long in control line. 3. Inspect your prop often. I recently had a wood prop come apart as soon as the thing fired up. It has been on the plane for probably 50+ flights without ground contact or any other incidents. 4. Keep in mind that the fuel we use is ungodly flammable. Smoking while you fill a plane is not a good idea, but a glow starter attached to a flooded engine can also catch fire. Nothing like having your hand on fire without knowing it. Until it burns. Have a great season and to all of you going to Brodak's - Good Luck! I'll be flying in Old time and CLPA beginner. Maybe carrier if I can figure out how to glue a foam wing back to itself. The annual meeting was opened by Joe Daniels with 12 members and 5 guests present The Treasurers Report from George Towns shows a $749.73 balance of this, $48.84 is dedicated for the winter / all weather flying program. The fee for the charter will also be deducted from this when it is sent in. The 33 member roster this year has several new members including John Brodak. Joe Maxwell talked about the All Weather Flyers and passed around the sign in sheets so everyone could read some of the comments (some humorous) the flyers entered. The three successful flyers were Joe Daniels, George Towns, and Joe Maxwell. Brodak's will be in June ... 12th to the 15th. If you do go, make sure you mention you're a member of the Bean Hill Flyers so we get a chance at getting the club participation award. The build contest plane this year will be any hollow log model. Proposed was a possible balloon busting event and a Coxberg event for these hollow log models. Other upcoming events mentioned are the Sharon Swap Meet on March 17th at the VFW, The Meadville Fly-in, Dan Rice Days, and the Ringmaster Fly-a-thon ... dates will be announced in the newsletter. 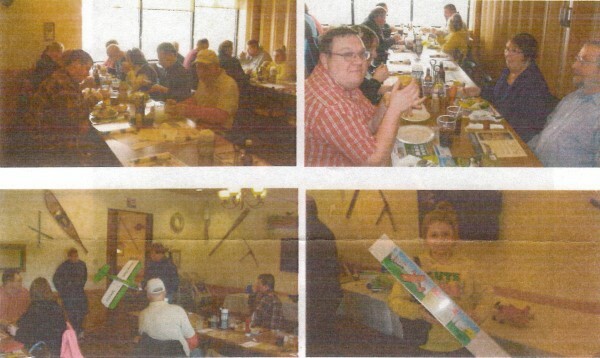 The door prize winners were ... Duane Hammett who won the hollow log kit, Tiffany Hammett won the Cosmic Wind kit, and Ken Keller won the Maxwell's gift certificate. Show and Tell was done by Randy Shaffer. The plane was a "Fancy Pants" done in Electric lime green and white. Some of the details Randy talked about were the painting process and blending the canopy into the turtle deck. A beautiful job. Thanks to the efforts of Bean Hill member Art Nordquist a couple of our flyers have two unusual models that date back to the 70's. Art obtained these planes from Patrick Rowan who designed and built them back then for possible stunt and slow combat. As many of you know, Art enjoys restoring old planes and does an excellent job at it. About a year ago Art put the two planes up for sale along with some of his other planes and they were purchased by Lee Hammett and Joe Daniels. The plane that Lee bought was the original Battle Wagon. It spans 40 inches and is powered with an old as .30 engine. This plane was designed and built in 1973. It has a race plane type look to it's profile but biggest distinction the Battle Wagons have is the wingtips which, at first glance, look to be put on backwards. Battle Wagon II was designed and built in 1974. 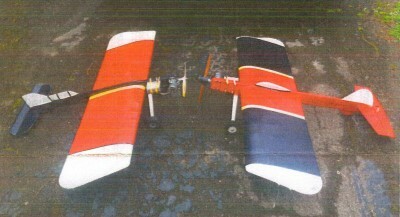 The plane has a more conventional look and is being powered currently with a Fox 36X. Patrick wanted to try to improve the performance of the plane so changes like a thicker airfoil, planked leading edge and a few construction changes were made. He feels that the original design is better looking and was easier to build but the second version was a better flyer. He also confirmed what several flyers have told me, that the shape of the wingtips adds to the planes flying ability, especially in windy conditions. The planes did have wire landing gear originally but other than that are the originals and both models have proven to be excellent flyers. For anyone interested, Joe Daniels is drawing plans that will include both versions. Also, worth noting is that as the dates have been verified by the original designer, both planes should be Nostalgia 30 legal. 1. 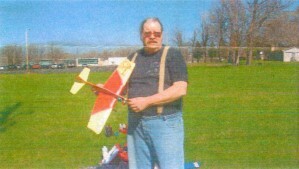 Joe Maxwell holds George Town's neat Twin-Engine Stunter. 2. Clint McBeth rebuilt this Magnum into a nice flying plane. 3. Dave Evar sent this picture of his hollow-log Beechcraft. 4. Bill Hayes with his 1/2A size Stunter.